Museum opens in Old City of Jerusalem in headquarters of youth group which blew the shofar in defiance of British Mandate policy. Eighty years after being closed by the British, Beit Plugat Hakotel (Platoon of the Wall House) will reopen, just in time for Passover (Pesach). 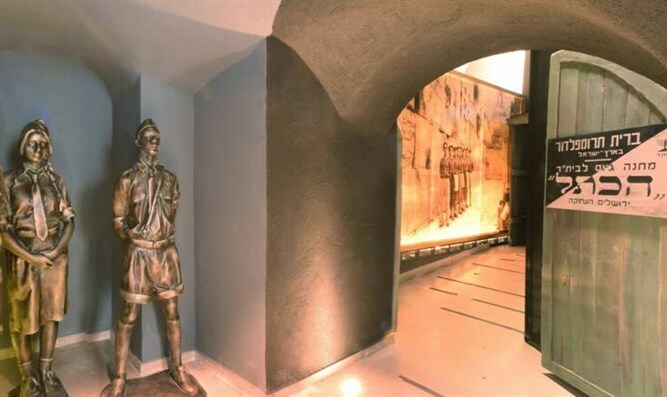 The home of Tzierei Beitar (Beitar youth) during the 1930s, the walls of the museum tell the Jewish-Zionist story of the defenders of the Western Wall and the shofar blowers active in the Old City until 1948. The Beit Plugat HaKotel Museum tells the story of the young members of the Beitar Movement, the Revisionist Zionist Youth Movement founded in 1923 by Zeev Jabotinsky that became the ideological forerunner of the Likud party, who resisted the increasingly anti-Jewish policies of the British Mandate as well as Arab terrorism. Beitar youth sought to defend the Jewish community living in the Old City and the Jewish connection to the Western Wall. Visitors to the museum will begin their tour with the sound of the shofar, which the youths ensured was blown at the Western Wall every year on Rosh Hashannah despite the British Mandate's ban on Jews doing so. They risked lengthy prison terms to ensure the continued practice of Judaism in the Old City of Jerusalem. As Arab attacks on Jews escalated in the late 1930s, Beitar established Plugat Hakotel, which had their headquarters in the building now housing the new museum. Beitar used the building for eighteen months until the British authorities evicted them and barricaded the structure. Now, 80 years later, visitors can once again learn about the struggle for Jewish rights under the British Mandate. The museum is located at Hayehudim Street, on the corner of Plugat Hakotel Street, in the Jewish Quarter of the Old City of Jerusalem. Tours will be given over chol hamoed Pesach (the intermediate days of Passover).